10kohm Thermistor Element (44006) Standard, 2252, 3000, 5000 and 30,000 ohm Thermistors Also Available. The 3-A Approved OMEGA™ THS-S-NB9W and THS-H-NB9W Series Thermistor Sensors are designed for use in Sanitary or Hygienic Clean-in-Place applications in the Food, Dairy, Beverage and BioPharmaceutical industries. These sensors are manufactured with 316L stainless steel housings that meet the dimensional requirements of ASME BPE-2007 and 3-A Specification 74-05, and are welded and processed to provide a clean, smooth, 32 µinch or better surface finish in the wetted areas for easy cleaning. If you need a process connection that is not listed above, please contact our sales department for availability. The probe stems are manufactured in two configurations; a standard ¼" diameter probe for standard duty service, and a stepped 3/8" to 3/16" probe design for good response times in heavy duty applications. 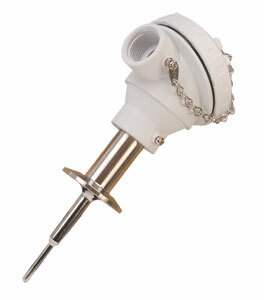 This sensor is available with either a white polypropylene screw-top connection head (NB9W) or a stainless steel screw top connectoion head (NB15) for connection to your process instrumentation. These sensors are also available in RTD and Thermocouple styles to accommodate any process input requirement. In addition to the standard 1½-16AMP flange design, this sensor can be provided in a wide variety of flange sizes and styles. If you need something a little (or a lot) different, we can accommodate your needs. For standard duty probe lengths longer than 6", change "-0600" in model number to the required length (example: 12" = "-1200", 9¼" = "-0925") and add $1 per inch to the price (up to 24 inches). For heavy duty probe lengths longer than 6", change "-0600" in model number to the required length (example: 12" = "-1200", 9¼" = "-0925") and add $2.50 per inch to the price (up to 24 inches). For other thermistor elements, change the model number from "10K" to the desired sensor code as shown in the table above at no additional cost. To order with a stainless steel connection head, change "NB9W" in the model number to "NB15" and add $37 to the price. For probe lengths longer then 24 inches, please contact Customer Service. Handheld meters Product Finder - Temperature, Humidity, pH, Conductivity, Voltage, Current, Flow, Pressure and much more!